Tiger was busy reflecting on the river while washing his face . " Hmm , well I'm a spunky , strong muscular body and color lorengku very beautiful , " said the tiger in the liver . Arrogance makes tiger bossy and act arbitrarily in other animals that are smaller and weaker . The deer finally can not take anymore . "Absolutely outrageous tiger ! " hare said with anger . " He must be taught a lesson ! Let cured ! Thinking , deer meet half way with rabbits . They talk about tiger behavior and try to find ideas how to make the tiger undeterred . After a long silence , " Hmm , I have an idea , " said the deer suddenly . " But you must help me , " said the deer . 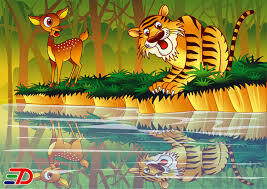 "Well , you told the tiger that I have to beat you because it has been bugging me , and say also on the tiger that I will beat anyone who dared to disturb me, including the tiger , because I 'm running an important task , " said the deer in rabbits . " What important tasks , CIL ? " asked the rabbit surprised . " Already , just say so , if the tiger later looking for me , he escorted down a large tree at the end of that road . Tigers I will wait there . " " But I'm afraid Cil , ya right plan will succeed ? " Said the rabbit . " Believe me , if you fail the deer do not call me clever " . " Yes, yes . I believe , but you do not get cocky , you 'll actually be more arrogant than the tiger again . " The meet runs kelincipun tiger lounging . The rabbit was a little nervous to tell that happened to him . After hearing the story of rabbits , tigers became furious to hear . " What ? Hare going to hit me ? Grr , how dare he ! ! , Said the tiger . As expected , the tiger asked to be taken to where the deer are. " That's Kancil ! " Rabbit said , pointing to a large tree at the end of the road . " We're almost there , tiger . I'm afraid , will not tell the deer if I told you that , then I got beat again , "said the rabbit . Si rabbit ran into the bushes .
" Hi deer ! ! ! Yes I hear you're going to hit me ? " The tiger asked angrily . " Do not talk so loud , I was given the task important " . " What important task ? ' . Then the hare pointed large round object , which depends on the branch of a tree on it . " I have to keep bende the will. " Bende wills what is it ? " Tanya tiger surprised . " Bende is a kind of a small gong , but this is not just any bende bende , melodious voice that was hit once , could not be painted with the words . Tiger so curious . " I should not have hit her ? , Who knows who else dizzy my head is going to go away after hearing the melodious sound of bende . " " No, no , " said the hare . Tigers continue to persuade the Kancil . After a long debate , " All right , but I go first , do not blame me if anything happens ya ? " , Said the deer . After the hare go , Tiger immediately climbed a tree and hit bende it . But what happens .... It turns out it was a beehive bende ! Nguuuung ... nguuuung ..... nguuuung bunch of angry bees out of the hive because it feels threatened . Chasing bees and stung the tiger . "Help! Help!" tiger yelled in pain as he ran . He kept running towards a river . Byuur ! Tiger immediately jumped into the river . He eventually survived the bee attack . " Grr , watch out you hare ! " Tiger shouted with anger . " I lied again . Pusingku But why be lost ya ? " . Although not heard the melodious bende wills , tigers are not too disappointed , because his head is not dizzy anymore .
" Hahaha ! Gallant Tigers Look scuttled stung by a bee , " said the deer . " Small and weak animals are not lost forever is not it? " . " I hope Tiger can take advantage of this incident , " the rabbit said hopefully. "